Hi all! I hope that everybody had a wonderful and safe Fourth of July! Going into college, I was excited but completely clueless. Imagine Bambi with his too-long and unsturdy legs, slipping and sliding every which way. That's me. Packing-wise and dorm decor-wise, I've definitely learned many a lesson: don't buy those square corkboard bulletin things. They don't stick and fall off like crazy. Chairs, ottomans, and full laundry baskets can all act as viable stepstools. Don't bring four huge suitcases full of clothes. You won't get to 86% of it. So on and so forth. But through these nine months, I've learned. And next year, the contents of the suitcases I bring to school will be very different. 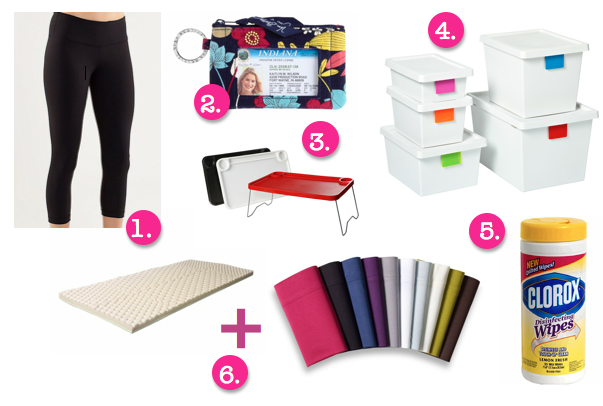 Listed below are some of the things that I found essential this year, and surprisingly so! They are all items I never expected to need, but turned out to be absolutely necessary. 1. Lululemon Wunder Under Crop: I know, I know, so many people are completely over Lululemon. It's trendy and expensive, I get it. But hear me out! I am so pleased with all of my Lululemon products, but especially these Wunder Under crops. I wear them to yoga classes and to the gym, but I also wear them as thicker leggings, so useful in the chilly Palo Alto weather. It has been the smartest clothing investment I've ever made! At school, I literally wear these four or five times a week and they are still holding up wonderfully. 3. Bed Tray: So, I didn't actually have this at school, but I've been using my sister's tray at home and it is so incredibly versatile, I am definitely bringing it back with me. Think about it: a dorm room is tiny and there are only so many spaces to utilize, one being your bed. This bed tray comes in handy when you want to eat in bed or just study - it keeps your laptop from getting too hot. Or even if you're lounging on a comfy chair or couch, this fits over your legs perfectly as a work/eating space. The one that is pictured is from IKEA and only for 8 bucks! It's practically stealing! 4. Plastic storage units: Once again, a dorm room is tiny, so you need as much storage space as possible. Plastic storage containers are so great for this purpose! The ones that are pictured are on sale at The Container Store for $8 - $23 each depending on the size (is anyone else obsessed with The Container Store like me?) and look amazing because they are color-coded. However, a variety in plastic containers is necessary - I had lots of smaller plastic trays and baskets for desk supplies, nail polish, accessories, etc. and bigger drawers for clothes. Handy, handy! 5. Clorox wipes: At $3.64, this is the cheapest, but one of the most necessary items for a college dorm! A dorm room gets gross. Dirty food gets on tables, the refrigerator stinks up, things get a little messy and dirty. Just wipe up the surface with some Clorox and you're good as new! Definitely a must-buy. 6. Memory foam mattress topper + jersey sheets: I was in love with my bed. All of those rumors about college dorm beds being absolute pooey, begone! Mine was heavenly because of these two items - a soft and cushy foam mattress topper in which I could sink into and jersey sheets - the softest, most cuddly things ever! I swear by them. I don't want silk sheets or 908504098234 thread count ones. I just want jersey sheets! And one bonus product: Mr. Clean Magic Eraser: Just trust me on this one. The permanent hair dye we got on the bathroom's paper towel dispenser. The hot pink color stains we got on the wall. Jelly color stains we had on the light fixtures/ceiling. Old tape marks. Anything. Everything. The Magic Eraser gets rid of it all. It's a miracle product. Anybody else have recommendations for dorm rooms/small places/college? These are fantastic suggestions! The Wella running tights from Nordstrom fitness section are amazing as well. thanks for the suggestion, will definitely have to look into those!